A significant reduction in greenhouse gases could preserve enough Arctic ice to promote polar bear survival, according to the results of a study published in the journal Nature in December. Polar bears were designated as “threatened species” three years ago by the U.S. Fish and Wildlife service in part because rapid melting of arctic ice threatens polar bear habitat. In the study, scientists from several institutions, including the U.S. Geological Survey (USGS), the National Science Foundation (NSF) and the University of Washington, found that if humans reduce greenhouse gas emissions significantly in the next decade or two, enough Arctic ice is likely to remain intact during late summer and early autumn for polar bears to survive. "What we projected in 2007 was based solely on the business-as-usual greenhouse gas scenario," said Steven Amstrup, an emeritus researcher at the USGS and senior scientist at the Montana-based organization Polar Bears International. "That was a pretty dire outlook, but it didn't consider the possibility of greenhouse gas mitigation." Amstrup is the lead author of this week's Nature paper. Co-authors are Eric DeWeaver of NSF, David Douglas and George Durner of the USGS Alaska Science Center, Bruce Marcot of the U.S. Forest Service in Oregon, Cecilia Bitz of the University of Washington and David Bailey of the National Center for Atmospheric Research in Boulder, Colo. In 2007, scientists projected that only about one-third of the world's 22,000 polar bears might survive to the middle of the century if dramatic ice decline continued in the Arctic. Eventually, they concluded, polar bears could disappear completely. However, slowing or reducing emissions could result in a better outcome, said Dr. DeWeaver. "We looked for Arctic sea ice tipping points in a climate model in which sea ice is known to be very sensitive to global warming, and we didn't find any," said DeWeaver. Specifically, the scientists looked at whether there's a tipping point beyond which seasonal ice could not recover. Not finding a tipping point indicates that the ultimate outcome for the bears “depends on how much greenhouse gas we add to the atmosphere in the future,” said Blitz. Previous work by Bitz and others showed that unchecked temperature increases, along with natural environmental volatility, could result in the loss of vast areas of Arctic ice in less than a decade. It also showed that with continued business-as-usual greenhouse gas emissions, the ice did not recover and largely disappeared altogether in following decades. However, the new Nature paper indicates that if greenhouse gas emissions were reduced substantially in the near future, rapid ice losses would be followed by substantial retention of the remaining ice through this century--and partial recovery of the ice that disappeared during the rapid ice loss. 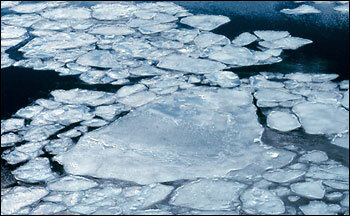 Polar bears depend on sea ice for access to ringed and bearded seals, their primary food source. During seasons when they can't reach ice, the bears mostly go without food and can lose about two pounds a day. The periods when they don't have ice access have increased, and are expected to continue to do so with the current level of greenhouse gas emissions. The study’s results indicate that increased retention of sea-ice habitat because of greenhouse gas mitigation would allow polar bears to survive in greater numbers throughout this century, and in more areas of the Arctic, than would happen with no mitigation. Amstrup divided the Arctic into four separate ecoregions according to the nature of ice typically found there. The 2007 study showed a very high likelihood that polar bears would become extinct in two of those regions given current trends in greenhouse gas emissions. "There's still a fairly high probability in both those regions that polar bears could disappear," Amstrup said. "But with mitigation and aggressive management of hunting and other direct bear-human interactions, the probability of extinction would now be lower than the probability that polar bear numbers will simply be reduced." "With mitigation, conditions for polar bears might even improve in the other two ecoregions," he said. "The benefit of mitigation to polar bears is substantial."